About two hours from Chicago, Sheboygan, Wisc. lies on the western shore of Lake Michigan. It’s not a small town, but it’s not a big one, either. 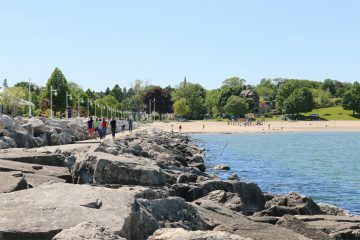 It isn’t crowded, but it has lake beaches and blue water, downtown can be active, and the people are Midwestern-friendly. According to the visitors’ guide I picked up at the John Michael Kohler Arts Center, Sheboygan is the “Malibu of the Midwest” and the Bratwurst Capital of the World. I can’t speak to the second moniker, as I never saw a single bratwurst during my two days there, but I’ll buy the first one. Sheboygan is like a lot of medium-sized cities in this area, in that you can get across town in about 15 minutes and find every conceivable chain from Wal-Mart (right next to my hotel) to Buffalo Wild Wings in town. There are strip malls that are virtually indistinguishable from the suburbs of Chicago, except the parking lots aren’t as full. But Sheboygan does have some unique qualities that make it worth visiting. 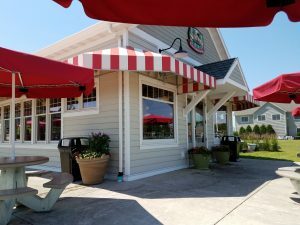 My two-day impression of Sheboygan is as a pleasant, laid back place where you can eat good food and have ice cream along the banks of a river, enjoy lovely lake beaches, and have a relaxing weekend without making a big production out of it. We arrived on Monday afternoon and checked into our hotel, the Holiday Inn Express. I have absolutely no complaints about our stay here, as it was stellar. My only wish is that the hotel was more convenient to downtown, because that’s where we spent a lot of our time. Still, it’s not like we were more than a few minutes away by car. The employees did not have the level of knowledge of Sheboygan that I required – but then again, only the Sheboygan County Historical Museum, which we didn’t get to, probably had that level of knowledge because I always want to know everything. You can do this museum in an hour or two, and you can get in with a suggested donation. 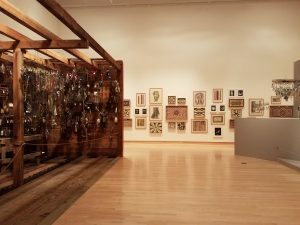 The image here is from the “An Encounter with Presence: Emery Blagdon 360°,” featuring a Nebraskan artist working with found objects. He creates sculptures designed to channel the earth’s energies to alleviate pain. It is one of several small exhibits taking place there now, and I believe the artists currently being displayed are part of the museum’s permanent collection. My personal favorite, actually, was “Mythologies: Eugene von Bruenchenhein,” with fantastical pieces from a Milwaukee artist. 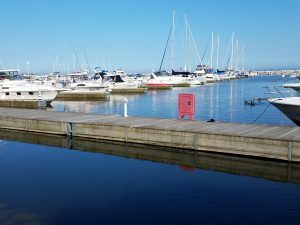 We took a short walk along the harbor to check out the Blue Harbor Resort, where we’d love to stay next time we come, assuming we have the cash, and the Harbor Centre Marina. My son insisted on calling it the “HBR CTR” the rest of our stay, because that’s what the signs around the city said, and he’s 12 with the accompanying sense of humor. It’s a lovely lake view, full of boats and seagulls and a lighthouse. We also walked into the Youth Sailing Center to find out if sailing was possible. The Sheboygan Youth Sailing Center offers classes to everyone, not just kids, but the ones they were offering are a week long so that wasn’t an option for us. They start on Monday for kids 7-18, and go through Fridays, and you can just show up on Monday at 8 a.m. to sign up for the week. Maybe next time. We also stopped at The GameBoard, a tiny little game store downtown. You can rent games while you’re here, and enjoy board game nights on Tuesdays for free – just come in and pick one out! Dungeons & Dragons is played here on Wednesdays. The store also offers free Sheboygan passports; you can get your passport stamped when you visit places around town. For dinner, we ate at Harry’s Prohibition Bistro & Wine Bar, a really nice place with a patio overlooking the river. The Italian-style food was comforting, and watching the sun set was a relaxing way to end the evening. We started out our second day with a trip to Kohler-Andrae State Park, which is where the above beach picture is from. It was beautiful and mostly empty, and we paid a vehicle admission sticker price of $11 for the entire day. We walked up and down the beach a ways, then did a short hike around the dunes. It only took us an hour or two. 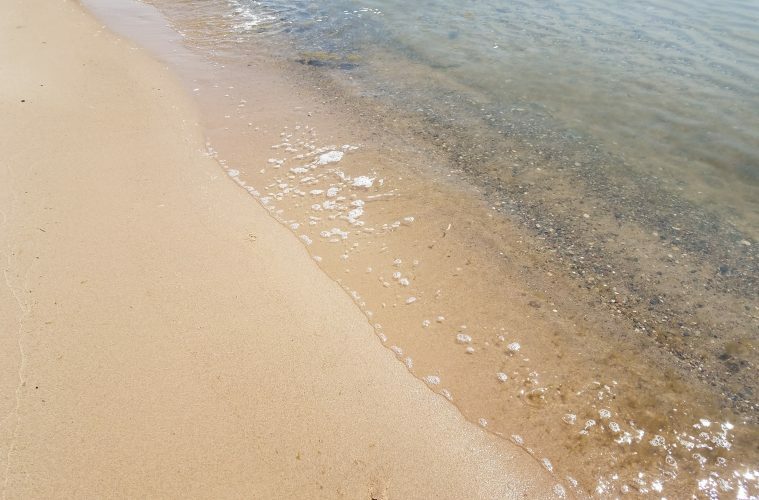 The water was cool and pleasant, and the sand was soft and warm. For lunch, we started with ice cream from South Pier Parlor. This place is a cool, old-fashioned storefront along the river, and of course we had our ice cream outside. Then we moved on to lunch, at Sprecher’s Restaurant & Pub. Once again, we ate outside, and had cream and cherry sodas. They don’t make the sodas here, but they keep craft sodas on tap. You can imagine how exciting this is for sugar-addicted kids like my son (sigh). Afterwards, we took a quick trip to Bookworm Gardens, a colorful and creative space for families. It’s basically a botanic garden with plantings and art inspired by children’s stories. Children love running around this place, and it’s fun for all ages. Except maybe jaded tweens, who maybe think it’s cute but would rather be on their cell phones (sigh). 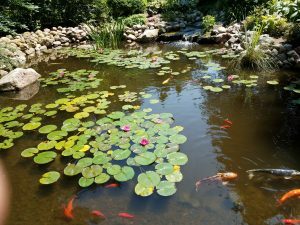 Although the koi pond, with sculptures from a few duck-themed books, was a hit with both of us. “to-visit” list). One for me, and one for my son. The first is Olivü 426, a beauty bar that will make you want to try everything. 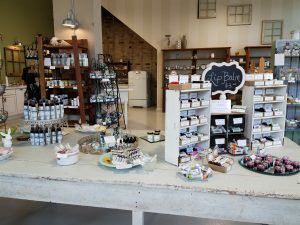 The great thing about this little boutique is that with many products, you can choose your scent and add it to the different products yourself. The Oatmeal Milk & Honey is my favorite! I’d recommend getting a little starter kit – it’s inexpensive, and lets you try some of the products the store provides to celebs at events like the Golden Globes and the Emmys. I made my own lip balm, from cherry and almond sugar flavors. We also visited Freaktoyz, a great used store for video games and geeky toys down the street from Olivü. They’re about to move a few doors down to a bigger space, but holy…! If you like geeky things, from Funko Pops to Legos, this is the place for you. I may have perused the shop for way more time than I meant to, running out the time on my metered parking. Or maybe that was when I visited Tj’s Closet, the cute little consignment shop that will soon be the new location of Freaktoyz. Sadly, Tj’s Closet is shutting down. Our last evening in Sheboygan was spent at Breaker Bay, the waterpark attached to the Blue Harbor Resort. This was at my son’s request – he wanted to spend some time there. Admission is half off after 5 p.m., so that was a good time for us to go. I managed to get exactly no pictures of the waterslides, the big bucket, or the whirlpool where I spent most of my time, but here’s a video of the place so you can see all the fun for yourself. For more information on Breaker Bay, visit the website. Wednesday morning was our last. We headed out around noon, but first we made our last hurrah the Sheboygan Farmers Market in Fountain Park. It takes place all day on Wednesdays and Saturdays throughout the summer, and offers a combination of fresh vegetables and fruits from local farmers, many sold by members of the local Hmong community, as well as gourmet food items like egg rolls and flavored lemonades. 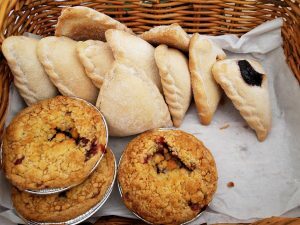 The image here is from a Mexican bakery that sets up shop here regularly and offered some really yummy elephant ears, cookies, and pies! After that, we left Sheboygan. We visited the half-hour Jelly Belly Warehouse Tour on the way home to the Chicago area, because FREE CANDY (tastings in-store, and a free package of jelly beans at the end of the tour). So, what did we think overall? The city of Sheboygan was very nice, although it was too spread out and full of chains to be unrelentingly charming. We were lucky enough to be there on a weekday, avoiding crowds, but I wonder how busy it gets on weekends? We didn’t actually do any watersports (EOS Surf Shop, central for this type of activity, is on 8th Street downtown, so not entirely walkable if you are carrying lots of equipment and have a whiny tween boy with you) – but the beaches and the lakefront were lovely and worth exploring. We didn’t go on a weekend, so that might have made a difference because there’s probably more activity. We also didn’t explore the nightlife, which seems to consist of mostly bars. 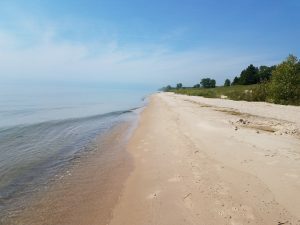 But for a family-friendly, low-key vacation spot within driving distance of Chicago, Sheboygan was perfect. The drive was green and pretty and didn’t seem long. 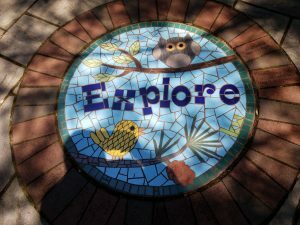 Kids have plenty to do – we didn’t even get to the Above & Beyond Children’s Museum! The food is good, the stores are cute, and the change of pace is definitely restful. All our restaurant meals were taken outside within view of water. In the future, we’d want to get outside city limits and explore Sheboygan County a bit. My son was two years too young for the reputedly awesome Kohler Factory Tour, and I would have enjoyed visiting the famous local spas such as the Kohler Waters Spa, nearby resorts like the Ofthoff Resort in Elkhart Lakes, and more of the natural areas. For this first trip, we decided Sheboygan itself had enough to keep us busy. But we’ll definitely be back! For more information on Sheboygan and what’s nearby, visit visitsheboygan.com. NOTE: Full disclosure – my two-night stay at the Holiday Inn Express was fully paid for as a result of winning a drawing offered at the 2017 Chicago Travel & Adventure Show, which I entered when I covered the event for the Windy City Guide. However, the results of the random drawing were not affected by my employment; none of that information was provided to organizers of the drawing. Next ArticleChicago CityPASS: See the Best of Chicago on A Budget!